American Opera Projects (AOP) explores the outer edges of the operatic form with DARKLING, an experimental opera- theatre work with original music composed by Stefan Weisman and libretto by Anna Rabinowitz. Spanning the decades from the 1930’s to the post-World War period, DARKLING is a remarkable story – both poignant and humorous – of love, loss, calamity and hope. Past and present blur, characters are swept along by the great forces of history and lives are bowed and buffeted in this uniquely moving and captivating work. “Brave and sensitive” (The New York Times), Darkling uses opera, avant-garde theatre, vaudeville and cutting edge technology to create “an unlikely collaboration of Wagner, Sally Bowles and Steven Spielberg" (Time Out/New York). This dramatic tour-de-force views history not from a grand geo-political perspective but from the insightful, intimate outlook of a poet whose ordinary Polish-Jewish family is unexpectedly affected by extraordinary events of the Holocaust. 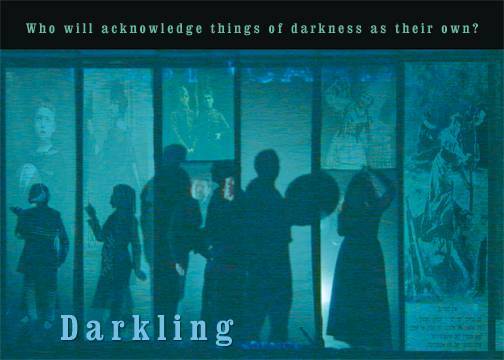 In 2006, American Opera Projects presented the world premiere of DARKLING, which ran off-Broadway for three weeks to wide critical acclaim. 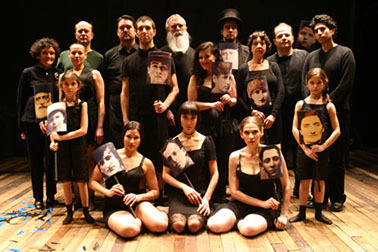 Subsequently, DARKLING toured in a concert version to Berlin and Poland and to the Center City Opera as part of the Philly Fringe Festival in 2008. Excerpts have been performed in many venues, including New York City Opera’s Vox series at NYU’s Skirball Center and the Works and Process Series at the Guggenheim Museum. DARKLING was created for four singers (soprano / mezzo / tenor / baritone), seven actors, and string quartet. The touring version of DARKLING reduces the number of actors to three and is adaptable to multiple venues. When American Opera Projects first approached me about DARKLING, the role that I would play in the piece was not entirely clear. The director, Michael Comlish, was overseeing the opera’s development, and his initial idea was that I would compose only some of the music, and then would supervise other composers who would complete the opera in a patchwork fashion. This concept of a multiplicity of compositional voices was meant to create a sense of fragmentation akin to the fragmented style of the libretto. I resisted, believing that such an approach would, in fact, create a disjointed work lacking a unified musical direction. I argued that I should write all of the music. After convincing all involved that this was how we should proceed, I felt a sudden feeling of dread, wondering how I would actually be able to complete the project, especially since the opera’s premiere was scheduled to take place in a matter of months. Anna Rabinowitz’s poetry was decidedly beautiful but complex. I read her book-length poem dozens of times, taking careful notes with each reading, and feeling more and more unsure about how to find a way to match music to her intricate language. At one point, I even considered withdrawing from the commission, and luckily, was urged by Paul Lansky, with whom I was studying composition at Princeton at the time, to continue. His simple advice: you have nothing to lose, and a great deal to gain. So, I committed myself to the project. Michael Comlish and I began to meet regularly, and we scrutinized the libretto scene by scene. Although it wasn’t always an easy process, I am very grateful to him for advising and guiding me as I composed DARKLING’s music. As I became more familiar with the poetry, I was particularly intrigued by its overarching structure. Anna’s poem is an acrostic based on Thomas Hardy’s “The Darkling Thrush,” so when reading down the left hand margin, one finds Hardy’s poem spelled out, letter by letter. I wanted to find a way to replicate the acrostic form in my musical process. Before I had even begun work on the opera, composer Lee Hoiby had been commissioned to set Hardy’s poem to music, a nod to the opera’s initial concept, mentioned above. I decided that I would use Lee’s song as the foundation for my personal reinvention of the acrostic form. I split his song into sections, and mapped those sections out across the libretto’s scenes. Then, as I began to write music for each scene, I examined those particular measures and used some elements of them—melodic fragments, harmonic progressions, or textural ideas—as I composed. Although Lee’s song has not been included in recent productions of DARKLING and is not on this CD, I owe a great debt to him and to his music. When I first met Anna Rabinowitz, I was certain I would have many questions about her poetry as I began the compositional process. I told her I expected that I would need to consult with her frequently. Amazingly, I never needed to do so. As soon as my work began, something remarkable happened…my initial feelings of doubt and apprehension were swept away. I discovered that underneath the poem’s layered complexity was a deep emotionality into which I was able to tap, and in this way the poetry came into vivid focus for me. Ultimately, my goal was to use music to instantly make those underlying emotions clear and direct, so that audiences would be able to connect to and appreciate the heartrending story and ideas I found in DARKLING’s poetry. The creation of DARKLING is a story of transformations. It is a story that maps the trajectory of bits of memorabilia found in a shoebox to publication of a book-length poem to production of a multi-media experimental opera performed in fully staged and concert versions to its present incarnation as a CD. Indeed, DARKLING owes its genesis to fragments—fragments of memory, fading photographs and yellowing letters saved in a shoe-box—that demanded presence of absence, recuperation, however limited, of life. The faceless, mainly nameless voices of DARKLING emerge from a world that is lost to us: that of Eastern European Jewry destroyed in the Holocaust. Yet these voices resonate powerfully with our own as we navigate a world in which cataclysm, genocide, war and unrest inform the almost constant uncertainties of being. DARKLING spans the period between the two World Wars, interweaving the phenomenal and emotional lives of its characters with the catastrophic events of history. DARKLING is not plot driven. Nevertheless, though the focus is placed on the emotions, the terrors, the incalculable losses of those years, the unprecedented narrative of the 20th century, particularly the Holocaust, remains an ineradicable presence. Disembodied voices, spoken and sung, vestigial utterances, shifting grounds, indeterminate events, ruptured histories. How does one make a poem from so much that is broken, unraveled, erased? Somehow, using Thomas Hardy’s “The Darkling Thrush”, as my armature to hold the scraps together, I made a book-length acrostic. It seemed a miracle. It was even more of a miracle when American Opera Projects engaged Michael Comlish to direct and Stefan Weisman to write the music for DARKLING, the opera. How does one embody the disembodied while guiding opera theater audiences over the uncharted, elusive terrains of memory and loss? Indeed, Michael and Stefan and a brilliant team of performers and technical wizards accomplished just that. They made a second, more remarkable, miracle—a poet’s dream come true. I cannot say it was my dream, because I never did, in fact, dream such a work could derive from my book. Yet, it did. And it was acclaimed by the critics! With the release of the CD another dream, I hope, will come true: my personal dream that DARKLING will now live its multi-dimensional life in our vast global world. Stefan Weisman has composed music of so broad and interesting a palette that it creates a deeply moving whole out of tears and wit, dance and lament, life and death, and a team of exceptional performers and production people have dedicated themselves, with a fervor Thomas Hardy could not muster in his poem, to creating a new form of opera for the 21st century—a form that shuns boundaries and is as abundant as life itself. I thank all my outstanding collaborators for demonstrating, by way of this CD of DARKLING, what is possible for music and poetry in the years to come. DARKLING is a multi-faceted work driven not by a linear narrative or anecdotal material, but constructed out of fragments of evidence and history gleaned mainly from letters and photographs found by the author in a shoebox her deceased father had hidden in the back of his closet. 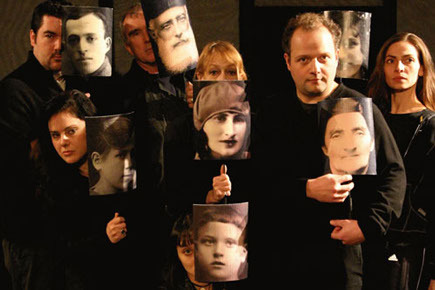 The operatic music theater work spans the period between the two World Wars, interweaving the emotional journey of Polish Jews with the unprecedented catastrophe of the Holocaust. While it draws on instability and uncertainty and memory and loss so central to the predicament of Polish Jews in the 20th century, it puts its focus on the emotions, the terrors, indeed the seismic travails of those times. The opera's emotional arc moves from loss to recuperation, despair to resolution, ultimately embracing life and the creative forces of memory and family. 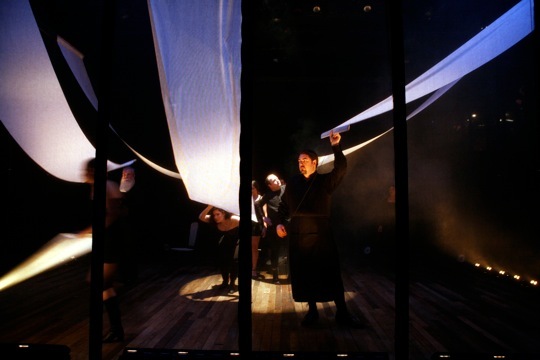 The original full production of DARKLING, which played off-Broadway for three weeks to standing ovations and great critical acclaim, made use of a dramatic setting consisting of 14-foot high scrim panels that served as a barrier/boundary for three sides of the performance space, the back wall of the theater serving as the fourth side. The audience sat outside this three-sided scrim area. Text and film clips were projected on the back wall of the theater and/or on the scrim panels. The audience read the libretto text and the projected subtitles for the songs as they watched 11 actors and singers move through a Brechtian-style staging. In addition, pre-recorded sections of the text were played and an original musical score, written for string quartet and 4 singers, was performed. The performance space, i.e. the stage and theater were dark when the audience entered. The overall feeling during the performance was of being inside the mind of the creator, and, finally, to awaken from a dream. Scene 1: Actors rise from the stage floor carrying masks of the dead relatives, about to enact fragmentary scenes in the poet’s mind based on anecdotes, letters, and memories. Scene 2: A silent film director dictates orders to a film crew that attempts to recreate the story of the poet’s parents. The poet pleads for the film to rewind, so she can try to make the past real again. Scene 3: The poet creates the completed silent film in her mind. The actors enact the hasty marriage of a young bride and groom in Poland, and the bride’s sudden departure for America. Scene 4: The mezzo soprano sings an aria about the bride, in the future, walking in the shadow of her husband. Interlude: An imaginary glossary of possible meanings. Scene 5: The groom, who has been left behind in Poland temporarily, is sleeping. In his dream, a young relative delivers a letter from the bride to her father (soprano aria). The dream melds images of the groom’s anxiety and the bride’s uncertainty as she sails to America. Scene 6: The Nazis have invaded Poland and post signs demanding that all Jews assemble in the town square. Many rush to evacuate. The bride’s father expresses sadness that his daughter left so soon after the wedding without saying goodbye. The groom escapes. Scene 7: The groom bids his mother farewell as he boards the ship to America. Scene 8: The poet is overwhelmed and moved by the postcards and photographs she has found. Thoughts of a peaceful life in Poland in the past are conjured up. Scene 9: A darkly humorous imagining of the young couple’s struggles and endurance in America. The bride works in a hat factory in New York. She recalls her trip on the boat in the form of a vaudeville sketch. The purpose of marriage is contemplated. Scene 10: The bride and groom grapple with the darkness of cataclysmic world events. Their passion is mixed with lamentations. Scene 11: The bride’s father (tenor), who remains in Poland, sings an aria expressing concern that his son-in-law may not come to say goodbye. Indeed, the groom has already left. Scene 12: A bass-baritone ruminates about the physical and spiritual afflictions of those who were trapped in Poland, persecuted, and ultimately annihilated in the aria “Cold in this Coat.” The entire cast performs with him. Scene 13: The poet contrasts the optimism of 1939 New York City with the extermination of Jews that was soon to occur in Europe. Actors play both the Europeans and Americans, with one actor portraying both the legendary Mayor LaGuardia of New York City and a Nazi radio announcer who describes a mass killing as if it were a work of art. Scene 14: The refrain of the traditional Passover song, “Dayenu” (“It would have been enough”) is presented in the context of the horrific events of the Holocaust. Scene 15: The poet experiences a catharsis, accepting her losses, realizing she was unaware, but determined to live with her griefs, not to dwell on them. The stage darkens, smoke rises from the floor. When the lights begin to come up, all the performers are gone. Pairs of shoes are all that remain on the stage. DARKLING was created for four singers (soprano / mezzo / tenor / baritone), seven actors, and a string quartet. The touring version of DARKLING reduces the number of actors to three and is adaptable to multiple venues. ANNA (soprano, spoken voice): A poet in extremis. 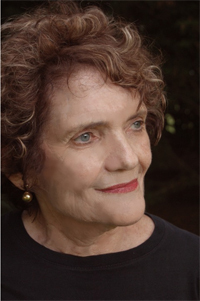 Several distinct voices enact her roles as narrator, commentator and meditator—as a young woman, a woman in middle age, and a woman in late life. Her family has been murdered in the Holocaust decades earlier. Entrapped by her mainly undocumented, fragmented knowledge of their lives and the lives of their friends during the period between the two World Wars in Poland, Anna rummages through scraps of memory, old letters, and photographs in an attempt to piece together her legacy of shards. All voices of Anna speak in different registers and tones, representing the multivalent aspects of Anna’s state of mind and of her quest to make the absent present. BRIDE (soprano, mezzo-soprano, and spoken voice): Mother of Anna, hastily married and conflicted, who emigrates from Poland to America. PATRIARCH (tenor): Father of the bride. 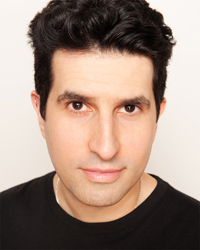 JEWISH MAN (bass-baritone): A man who represents the victims of the Nazis. GROOM (spoken voice): Husband of bride. He waits in Poland for documents to arrive from the bride that will permit him to join her in America. MR. BAD LUCK (spoken voice): A malevolent spirit. MULTIPLE SPOKEN VOICES: Various men and women, often in quick succession, and in groups of different sizes. Unknown, nameless. Concert reading of scenes. Post-show panel discussion with creators. Co-production with Friends of Freie Universität Berlin as part of Jewish Documentary Film, Theater and Speaker Series, German Consulate General, Auditorium, NYC. Peter B. Lewis Theater, Guggenheim Museum, NYC. Director Michael Comlish held performance workshops in Brooklyn and Manhattan to develop Darkling by exploring each section of the original poem. The following performers participated: Elzbieta Czyzewska, Rana Kaye, Peter Kazaras, Dylan McCullough, Carol Monda, and David Tirosh.